Take an open vessel and add all the ingredints to make the syrup . Boil the syrup till it becomes a bit sticky,when held between your 2 fingers. Dont make it too sicky,otherwise your jamuns will not soak in the syrup and will become hard. You can add the jamuns after they get deep fried to this syrup and cook for about 8-10minutes. Now take a bowl and mix all the ingredients together and knead well to make a soft dough by applying ghee on your palms. The dough will be sticky initially but as start kneading it will become soft,you dont need to add any milk or water. Make small balls with this dough ,greasing your hands a bit everytime. Make sure the there are no cracks on your balls. Your balls are ready to be deep fried in oil. 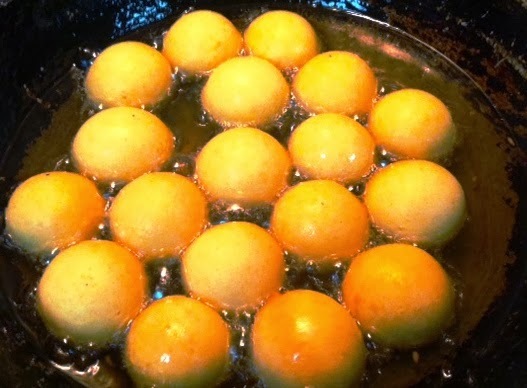 Heat oil in a vessel(kadai) to deep fry the gulab jamuns,simmer the flame so that the oil is medium heated till you make the balls. The oil should be not too hot,start putting all the balls one by one in the oil. 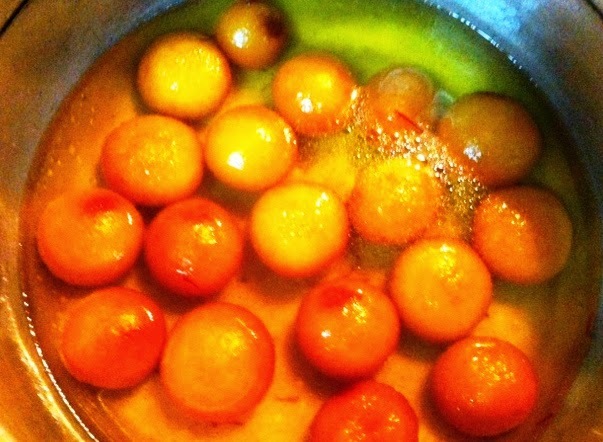 Keep stirring till the gulab jamuns turn nice brown in colour. The balls should take atleast 5-7 minutes to turn brown in colour. By doing this the balls get properly cooked from inside. Now transfer these balls into the sugar syrup and cook this syrup with jamuns for about 8-10minutes. 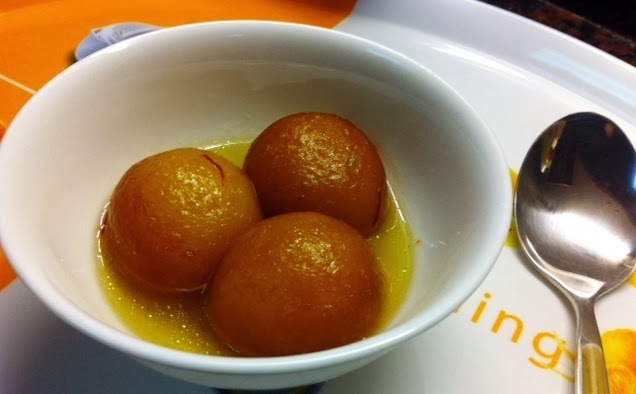 Your gulab jamuns are ready now. Tranfer them to your serving dish. Very informative and inspiring post have been posted here. I bookmarked this blog further more information about new Indian recipes.last weekend i visit a Indian restaurant for dinner. it was awesome experience of gulab jamun taste. I never forget it's taste.I am going to cook it at home. As salaam alykum anjum baji.i tried most of the recipes from ur blog n they turned out the best for my guest,but in this recipe it flopped.i made around 50 jamuns n they were hard n like rubber texture while eating .i followed all d steps as u said. Hi. Sorry to hear it didn't come out good. I mentioned in my third point ( procedure section) that if sugar is more then it becomes sticky. Pls try first in small quantities and once you are confident go for large portions. Thanks baji.in sha Allaah I ll try again. Wonderful recipe. It never fails. I have always received praise for it. However, credit goes to you. Thanks for sharing.